This Tiny Pocket Scanner Tells What Your Food Is Made Of in One Zap. The SCiO device uses the molecular footprint of an object to tell you its chemical makeup. Have you ever tapped on dozens of watermelons at the grocery store to find the sweetest out of the bunch—only to get one home and find out it’s a sour dud? Well, in less than a year, you’ll be able to tell which melon to buy, thanks to a USB drive–size pocket device. Israel-based company Consumer Physics recently announced a Kickstarter campaign for a pocket molecular sensor called SCiO. The tiny device will have the ability to scan the molecular fingerprint of physical matter, such as food, medicine, and plants, and identify its chemical makeup. Think of it as portable x-ray vision that can see beyond the surface of an object and identify the good, the bad, and the ugly lurking inside. Cofounder and CEO Dror Sharon showed me how the device works by scanning a piece of cheese. 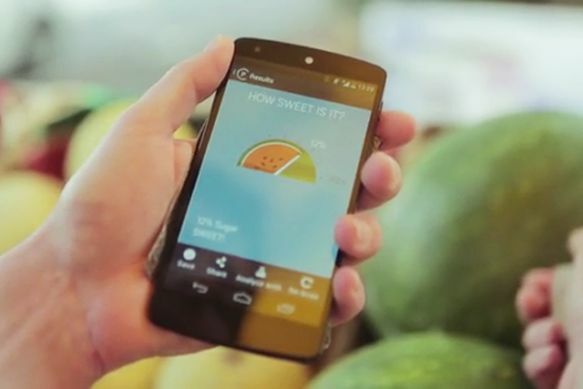 Within seconds, through the SCiO smartphone food app (and with no manual entering of information), the type of food and nutritional scores appeared. He then showed me the nutritional facts on the actual packaging of the cheese, which matched the scores the SCiO picked up through scanning. If you wave it over your watermelon, in seconds the ripeness and produce quality, as well as the calorie, fat, carbohydrate, and protein breakdown, are delivered to the app. This entry was posted in Miscellaneous and tagged How to Stop Eating Crap!. Bookmark the permalink.